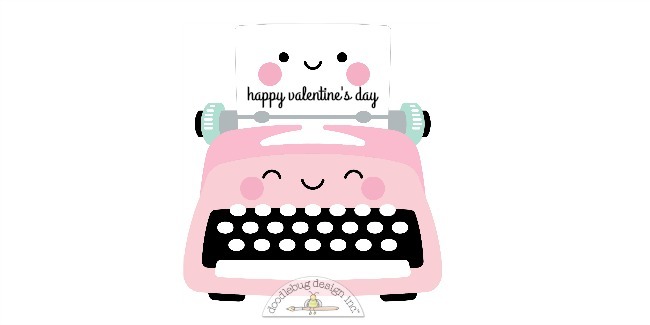 We'd like to wish everyone a Happy Valentine's Day!!! Historically February 14 is the most romantic day of the year so I thought it was fitting to scrap about my husband who very rarely allows his face to be in front of a camera. However, because I was using the 'So Punny' collection I thought it would be more fun to do a lighthearted page with the same sentiment behind it. The entire layout design was based directly from the little television icon which I loved from the moment I found it inside the Odds & Ends packet. I really wanted to replicate the test pattern stripes but I also couldn't shake the idea of having a heart background. So after a few sketches I settled on a striped heart that I could stitch with matching color thread to the test pattern. And how fun to find a matching remote... which gave me the idea to have 'Remote Hog' as the title to my layout. Although I seriously think my husband would disagree! 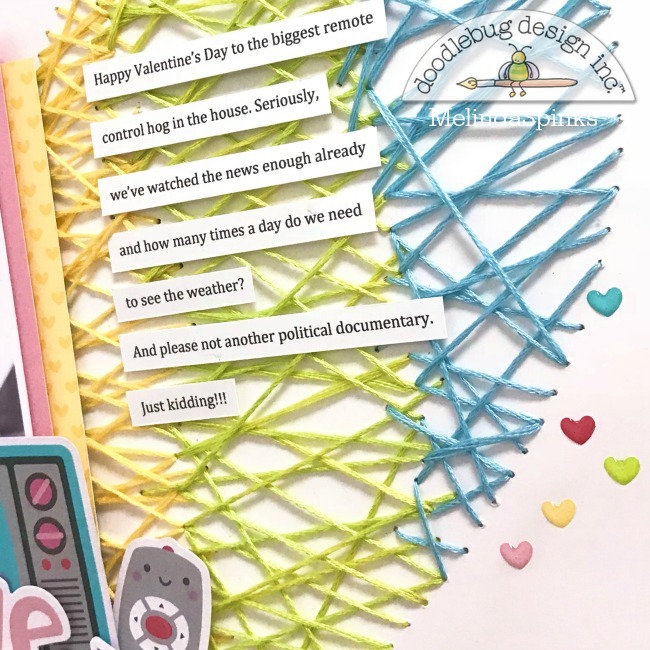 I also used the little pink 'love' arrow sentiment from the brand new 'Chit Chat' pack. Speaking of new products, the teenie tiny hearts are the latest Sprinkles and I have used almost two packets already. I cannot get enough of these little pieces because they make the perfect embellishment without being too heavy on the overall design. I hope everyone has a wonderful day whether they celebrate Valentine's Day or not. It's nice to simply do something for someone you love regardless of the date. That heart is amazing!! FABULOUS Layout! OMG What a Spectacular Layout. Love your Journaling LOL!!! Your Husband is really handsome..but totally get it my hubby doesn't like to be in a photo shoot either...again a handsome guy great smile but nope! Also a remote hog LOL. Your Needle work is Impeccable WOW!! Your Layout is Spectacular you so did a Super Outstanding Creative job! OH and BTW when I saw your hubby's pic immediately thought OMG he looks just like the actor David Duchovny!! Just sayin'!! Thanks for sharing your Great Layout Recipe and your Tips, Tricks & Techniques. YOU so ROCK! !